Australia's World Cup campaign got back on track thanks to a controlled performance against the dangerous Nigeria. A brace from Kyah Simon in each half was enough for the Matildas to see off the Super Falcons' challenge and move them into second place in Group D.
So what did we learn from the encounter? Kyah Simon deservedly gained the headlines for her neatly taken goals but this effort was truly a team one by the forward line. While all the pre-game talk was about Nigeria's pace, Australia brought their own weapons to the speed battle and arguably more finesse. The key for Australia was the wide areas. With Emily van Egmond, Katrina Gorry and Elise Kellond-Knight slowly but surely beginning to control the centre of the park, the runs and positioning of Lisa De Vanna and Sam Kerr became important. One notable fact was the ability for Kerr and De Vanna to seamlessly change wings giving the Nigerian defence a constantly different challenge, a different look. With the wingers providing the width, Simon then smartly worked the central channel, going deep to be an option and bouncing off the attacking midfielders or spraying balls out wide to her forward teammates. The result was a constantly moving attack with Australia getting in behind the Nigerian defence more consistently than Sweden could manage and Australia getting 13 shots on goal with 10 of them inside the penalty area. Greater execution could have provided an an even better scoreline. In a 4-3-3, the preferred formation of Australia, the defensive midfielder plays a crucial role. Australia has been searching for this player for a while now with many auditioning but in Elise Kellond-Knight (KK), they appear to have found the answer. In this role that she is well suited to, KK's contribution has been two-fold; she is the shield of the back four and the link between the back four and the attacking midfielders Van Egmond and Gorry. In being the catalyst of the attack, KK's awareness of pressure, ability to play out of tight spaces, passing range and angles of support have been excellent. Defensively, the 24-year-old's reading of the play, ability to disrupt the Nigerian attack and sweeping in front of the back four meant the central defenders rarely had to step up, leaving inviting space in behind for the quick Nigerian forwards. Her positional discipline also meant Stephanie Catley and Caitlin Foord could move forward to support the attack. All it in all it has been two first class performances from KK. Defensively, Australia learned the lessons from Sweden and were close to spot on. Stajcic used the pace of Catley and Foord to slow the influence of Asisat Oshoala and Francisca Ordega on the wings while Laura Alleway and Alanna Kennedy were solid at centre back. This was pitched as the battle of two of the quickest teams in the tournament, which it was, but in the end it was Australia's organisation and composure that resulted in their win. Whether it was the defence making the right decision to clear (the Matildas had 23 clearances all up) or picking the right pass, as with De Vanna's run and ball to put through Simon. Australia were able to smother Nigeria's pace with a strong game plan and by adapting their own performance to suit their opposition. 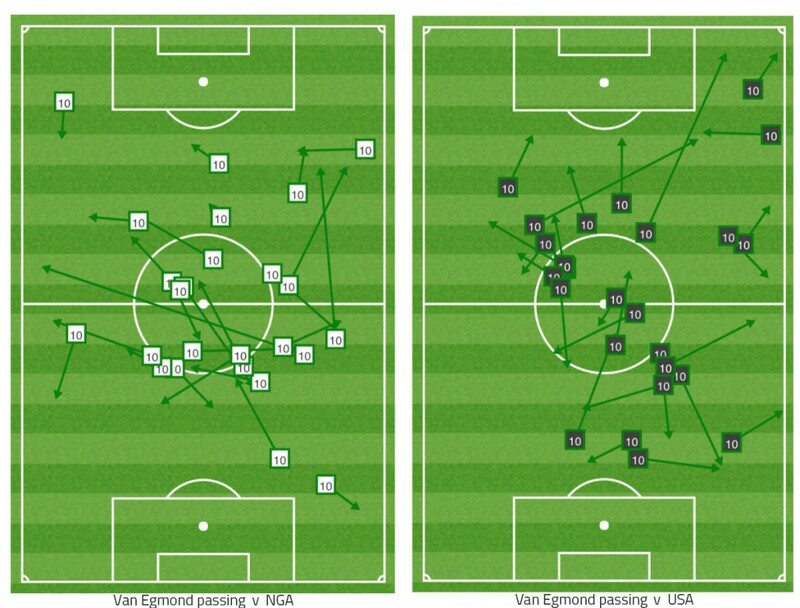 For instance, Van Egmond played a little deeper against Nigeria than she did when dictating terms against the United States. It's not much of a difference but, like KK, her positional discipline made it all that much harder for Nigeria to pick their way through the midfield and the likes of Ngozi Okobi to play defence splitting passes. 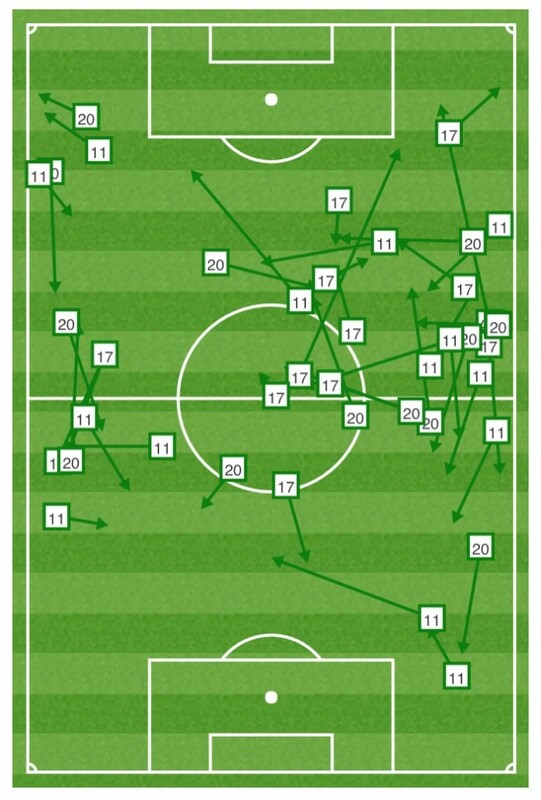 Playing a slightly deeper defensive line meant the pitch was more compact having the dual positive response of denying Nigeria space to play into while giving Australia that same space behind the Nigerian defence. Australia may have one of the quickest teams in this competition but it will take more than that to advance from the group and give the World Cup a shake.